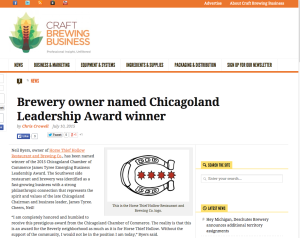 We positioned the client as a young successful and rising entrepreneur, professional chef, award winning craft brewer and leader in his industry. We developed earned media placement opportunities through feature stories and spotlights in trade media. We also worked to gain exposure and increase awareness of both the brewery and restaurant focusing on key special events, unique items and collaborations generating general television, radio and print media news stories. 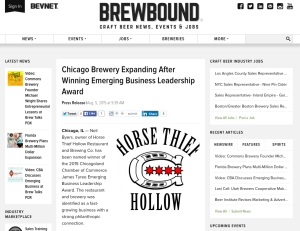 We continue to identify relevant organizations to position client as a thought leader positioning him to participate in future events across Chicago increasing his exposure as an award winning, young entrepreneur businessman, chef and craft brewer. We share all earned media placements to be posted across the client’s social media channels increasing the awareness, exposure and often sparking new opportunities. We secured earned media placement story in trade media outlets increasing his business position and awareness of his accomplishments, goals and expansion. 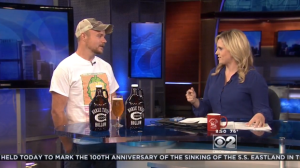 We also garnered local television coverage of an upcoming event and strong example of his giving back to community while building an audience for his craft brews as he works towards expansion of product distribution.